About: Zoo Bar is a lively drinking bar with a comprehensive cocktail list. They have a late licence 6 days a week and a happy hour from 1pm-7pm every day. They play a variety of up-to-date music. The Venom nightclub is situated downstairs playing a wide range of commercial Dance music. It has a welcoming atmosphere and a funky feel to it and attracts a fun-loving crowd. They have many options for private parties - rooms are available from 200 to 550 people depending on specific requirements. Cocktails, music and Leicester Square, Zoo Bar is the ultimate central London party venue. If commercial is what you want then that’s what you’ll get. From the cheesiest RnB, to cocktails that take you back a decade - Long Island iced Tea anyone? Not one to visit every week, but always a good time. Sometimes all you want on your birthday is the comfort and stability of a top Leicester Square bar. Forget the charming pubs of West London, the basement bars of East London you want party tunes and the chance to dance like no one’s watching. Zoo Bar in Leicester Square gives you all this till the early hours. If you like to drink in central London for student prices then the Zoo Bar is the place to be on Monday nights. Cheesy divas and lads will be present en masse but for the prices, what’s a feather boa or two? It’s the West End and you’re out looking for action but where do you go? To Zoo Bar of course, where the combination of drinks promotions and party tunes make it a popular destination with likeminded Londoners (and tourists) looking to strike up a conversation. This place is terrible. Told by the door staff that it would stay open until 4.30am, and drinks were £2 all night. Paid to get in, drinks were over priced and fake spirits. And closed before 3am. We were then literally thrown out of the door by 3 bouncers who didn't even speak English. ****in' bouncers..they're so rude!!!! I just left my friends' stuff on the corner for me to watch over but then that stupid bouncer shook my neck and told me to leave the stuff inside the cloak room.. I got so ****ed off with what he did, he could have said things in a nice way. I told him not to touch me then he told me to get out! I didnt even do anything wrong.. He was the one being aggressive! if anything happens to my neck, I'll sue them! LOL!! I trotted on to Zoo bar precisely 37 days 12 hours and 1 minute ago. The place was fantastic, guest list was all sorted before we arrived, no queing as we were on guest list. door staff anf bar staff treated me like god and the drinks were to die for. the music, well lets just say kept my boucing all night long. i have one criticism about the place and that is it shut way too early. i cant wait to visit this venue again so i can rock my socks off!! i would recommend this to anyone if the three reem girls from magaluf, we are planning on attending again very shortly. p.s dont let hannah in. 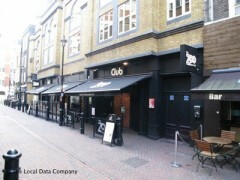 A group of friends (about 10 of us) and I visited Zoo Bar & Club on Saturday 28th May for my 21st birthday, and although overall we had a good time, there are a few things that I think need improving. Firstly, on the bottom floor, the bar area absolutely stinks. It literally smells of feet; horrible. The drinks also seem quite pricey. I mean, I don't mind paying £6.60 for a cocktail, as I think that's pretty good for London, but later in the evening, I ordered a vodka + redbull and got given vodka and monster and it cost me £7... I think that is ridiculous, I was better off getting a cocktail as I HATE monster and it was not what I ordered. I ended up leaving it, it was that gross. We were also approached by a shot girl, who we bought a couple of shots of tequila from after bargaining with her to give us them for 3 quid each (which I think is extortionate) after all that, they were WATERED DOWN. Additionally, we were told that the dress code was smart-casual, so my party were turning up with guys in shirts, smart jeans and shoes and the girls all in really gorgeous dresses and high heels... In the end we just felt SO overdressed. There were other people in the club in tracksuits and flip flops. The clientele of the club were not trendy at all. For a Saturday night at a club in London, I found this very disappointing. I feel we went to so much effort for a mediocre night. All in all, the night was okay, but I think that was mainly due to the company that I was with. Oh, also KUDOS to the photographer guy at the club, as he took a lovely photograph of me and my friends and that was great value for money at only £5. I don't think I will be returning to Zoo bar on a Saturday night for any type of celebrations, perhaps it'll be okay during the week for a student night. We went there last night after our Christmas party dinner. We wanted somewhere fun, relaxed and close-by to our restaurant and I suppose, potentially a bit tacky/cheesy- something different to Shoreditch (where our offices are based). From the outset, the door staff was rude, the woman on the till was rude and their management was rude. We had booked and paid for tables and were met with absolute disdain. When we asked to be shown to the reserved area, bearing in mind none of us had been there, and inquired about our complimentary pitchers- it was met with complete indifference and as though we were hassling them. We had been there an hour and half before one of their intimidating 'bouncers' asked us, very aggressively, to move all of our belongings to another table, before another immediately after-wards ran over to say the exact same thing for no apparent reason. Power trip much? The clientele left a lot to be desired and I really don't know how this place has survived for so long?! Sub-standard place for ordinary/common people. Our night was made enjoyable because of the company and I suppose that is what it always comes down to anyway. One of the worst bar in the area! Went there last saturday for a birthday in the afternoon, we were sitting at a table 10 of us... and were being told to move around the bar to comply with the crowd of drunkn people which didn't stop all evening after 4 hours of patience we had enough and left the place. Nothing special. Plain, too crowded, as regarding the people's manners in there- well, almost lacking. I did have quite a good night out here, but unfortunately it was nothing special. The staff, (especially the ID demanding bouncers) were really unfriendly almost to the point of rude/aggressive and because it was a Saturday night drinks were expensive, but you do save money by putting yourself on the guest list. Downstairs is a bit of a manic rave which can be fun, but the atmosphere was dull and was only made better because of my friends being there. Upstairs is more relaxed, but you can still dance and have fun. The crowd seemed alright, but there were a lot of orange-faced, neon clothed chavs and pervy men. I wouldn't say never go as the student night does seem like a good (and cheap) laugh, but I would pick other places over this. It's nothing special, if you know somewhere better go there instead :). A friend invited me here for a birthday party. When a group of us arrived we were treated with disdain - anyone would think they didn't want our custom. Then they demanded ID from everyone - I didn't have any, so was refused entry. (Incidentally the website says that you MAY be asked for ID, and MIGHT be refused entry, under age policy, not general entry requirements - I am no spring chicken, and hubby is 45). Then they prevented everyone else from going in because there were fewer girls than guys, and they were all told to wait in the rain until other people from the group arrived. Very rude bouncers, no customer service. As there is no legal requirement to carry proof of ID with you in this country, and it is actually possible to have neither passport or driving licence, I was amazed that they can enforce this. And they scan your ID - any idea what they do with that information...clone it perhaps??? Avoid unless you want your evening ruined early by surly bouncers. i went to zoo club last tuesday with a couple of my aussie mates, it turned out that tuesday happened to be student nite which ment drinks were really well priced, double v.red bulls like 2.50 which u struggle to get in most whetherspoons although glasses are smaller!! nice club, good music and nice crowd.... would defo recommend, il be there this tuesday too no doubt! Started the night having paid 5 pounds to get in. Was an ok night, quite lively. Night ended poorly however with the cloak room staff losing the ticket for my girl friends bag then behaving aggressively rather than constructively towards us. Only go to this bar if you class yourself a chav. I love going to Zoo bar as it is the one place where you can go just to party and be yourself. It is so much fun! When i go during the week the drinks prices are the best, but a saturday night is one not to miss. I know why their shirts say party hard or go home! I went to zoo bar last thursday, and I thought it was great!!! I was drinking double JD and coke all night and they were only 3.75 each which was a great bargain compared to everywhere else i've been in london. Music was fantastic, they had r'n'b, house and chart music will definately be going back!!! I was on the guestlist with about 10-15 other friends but we were given a small, tall, circular table with no seats as our 'booth'. Then we were hassled by security constantly to 'not use our area as a cloakroom' so they literally wanted us to check everything in. Even my handbag! Plus not a scrap of toilet paper to be found in their way below standard loos! Good music...very lively for a Thursday night...downstairs was a lot of fun, good on them for that. But too crowded! It was sweaty hot and way too small. They shouldn't let so many people in. Drinks are crazy off it - 7 pounds for a good ol double rum and coke. My friends and I paid £7 each to go the Zoo bar on Tuesday night. When I was using the bathroom I saw one of the bouncers looking over the toilet stall doors while someone a guy was using it. I thought that was disgusting. Later, I put on a baseball cap that my friend had bought with him. Then a bouncer told me to put my drink down and go out side to "talk" to him. When I got out side he said I wasn't allowed back in side and he wouldn't give a reason why. In case your wondering I wasn't drunk and I wasn't causing any trouble, which really ****ed me off. They basically ruined me and my friend's night for no reason. Oh one more thing. If by fantastic music they mean music from the 80s and musicals, then I guess they were right. I would certainly call that great music. I also thought drinks would be more expensive (it was only just over 3 pounds for a beer!) So quality. i went to the Zoo Bar for the first time last night and i had a really good time. I thought the DJ was great, i don't remember him playing a song i didn't like. It was a really good mix of music from dancehall to bhangra and Rnb i heard a little bit of garage aswell which was cool. i would definately go back. The venue itself i thought was an ok size, presented nicely. The only thing i could say i wasnt happy about are some of the people i saw in there and the amount of pushing and shoving there was. Overall though i thought is worth going to. the music was supposed to be RnB but changed very early to dance and when i asked for something alittle more RnBish the DJ was kinda rude n told me i should go upstairs.took a while to get busy.also my boyfriends jacket got stolen but we did get it back!i think i generally had a good time cos of who i was with but may not always be sucessful if that makes sense?! Myself and 12 other friends went to Zoo Bar for a girls night out!! What a great atmosphere that place has! I reccommend this venue to everyone if you want to guarantee a fabulous night of fun!!!!! I will definately go back!!!!! Oh one more thing. If by fantastic music they mean music from the 80s and musicals, then I guess they were right. But I would not call that great music. I also thought drinks would be less expensive (I saw on the website it said drinks from 1.50, however the cheapest drinks was over 3 pounds for a beer!) So dissapointing. I got on the guest list for the Zoo Bar and I went at about 9pm and got in no problem. However, we only got into the second floor (on street level). I was told that it was a two-floor bar/club and that before 10 it was free, however the bottom floor only opened at 10:30 and the only way to get in was to pay even though I was on the guest list and I was there before 10. I thought this bar was rubbish. I just wanted to give my friend a good 21st birthday and dance a bit, but we really did not enjoy ourselves at all. I would never recommend this club to anyone. Also my friend's purse was stolen from there and that led to an even worse night. Do NOT go to the ZOO Bar/Club!!! Best night out I have had in years, great music upstairs and down, fantastic drinks and a great crowd. We were allowed to dance on the bar and heard some great songs! Hmm Small dance floor although music OK - can get sweaty. Try the cocktails then try and walk home.